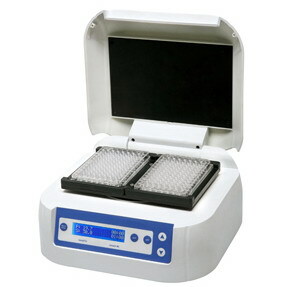 MB100-2A Thermo-shaker is a high performance microplate incubator and orbital shaker which accommodates up to two microplates. MB100-2A Thermo-shaker is a high performance microplate incubator and orbital shaker which accommodates up to two microplates. The MB100-2A can be used for any enzyme or cell-based assays requiring uniform and strictly controlled incubation up to 70°C and effective mixing. Temperature, shaking speed, and incubation time are programmable via the keypad, while the status parameters are displayed on the LCD in real time via an easy to use interface. Microprocessor controlled heating plates above and below microplates provide uniform temperature with less than 0.5°C variation between any two wells. This ensures outstanding and repeatable assay performance.